The shutters of Kakkayam dam are opened. 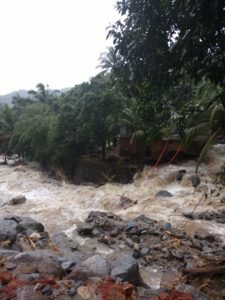 The water-flow has intensified.Meanwhile landslide and flash-floods have hit normal life in hill-region of Kannappankundu in Kozhikode. The central team visited flood hit areas in Kozhikode, today. People are advised to keep away from river sides.Fishing has been banned. The district administration is sharply monitoring the situation.Indian Army is likely to join in the relief operation in flood-hit areas in the district. This News was posted on Thursday, August 9th, 2018 at 9:42 am and is filed under City Talk.